DSLRs have become extremely popular among video production companies particularly when producing video for web and promotional videos. Firstly, what does DSLR mean? It’s simple really, a DSLR is a digital SLR, and SLR derived from the single lens reflex cameras, giving us a Digital Single Lens Reflex camera. Single lens reflect cameras have a mirror in front of the sensor, so the light that comes in is also reflected up from the mirror to the viewfinder. To understand single lens reflex in more detail check out this SLR diagram. This has a similar effect to “gain” on a film camera, it digitally brightens the image, in a DSLR ISO determines the sensitivity of sensor, the lower the number the less sensitivity, ISO typically goes up in denominations of 100, 200, 400, 800, 1600 and 3200. For well lit scenes like outdoors on a summers day, ISO would typically be set to 100 or 200. In poorer light situations like in a dark room ISO may have to be set to 400, 800, or even higher. But be careful when using it, anything over 800 tends to become noisy, this does depend on the quality of your camera, some may even become noisy at 400 ISO. When talking DSLR, the sensor is an important factor. Sensors vary in size, and size reflects quality and low light capability. Lets compare Canons bug players in the DSLR world, the 5D mark II and the 7D. 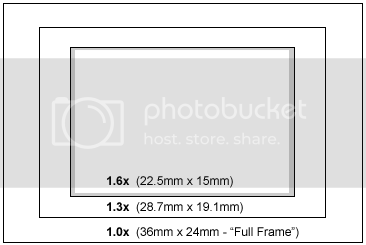 Now the 5D has a bigger sensor at 36 x 24 mm which is about the size of 35mm film, this is known as “full frame”. The 7D‘s sensor is slightly smaller at 22.5 x 15mm, this is still big compared to a lot of DSLRs, but what difference does this make? The 5D sensor gives a more shallow depth of filed, this is consider better by most photographers and film makers because it looks more artistic, the image is sharper and what is in focus tends to pop out more and look generally more attractive. Again the bigger sensors are better. Because it is larger, it is better at handling ISO without causing noise, the 5D can handle 1600!SO and still look acceptable where as the 7D wool deb too noisy. As mentioned the 5D has a full frame sensor and the 7D does not, this means the 7D will have a “crop factor” which basically means the frame or image is cropped to fit the sensor. . .
As you can see the 7D has a crop factor of 1.6. this means the lens you are using is technically longer, a 50mm for example would become an 80mm (50 x 1.6 = 80) This isn’t necessarily a bad thing but it is difficult to achieve wide angle shots even with a wide angle lens! DSLRs have become extremely popular in the world of video production and film making, here’s why. . . Pretty much all DSLRs can shoot 1080p HD video which is incredible, the best infact! Ranging from a few hundred pounds to around £2000, a DSLR is way cheaper than any video camera of similar performance. some call it the film look, it certainly has enough suitable lenses, accessories and setting to give a beautiful image. Don’t forget DSLRs primary function is a stills camera! Offering many functions and photo modes it really is 2 for 1.